I've got all kinds of plans for today, but first I must leave the house. Of course, I had to go through my routines on the computer: read e-mail, check stats, look over facebook, edit a photo or two, check in on Tumblr, log into Etsy, yadda yadda yadda. . .. I'm FINALLY at the point where I can leave just as soon as I get this blog post written. I'm going to try my best to not sound rushed, but I've got a friend with an infant who is waiting for me to get there so she can take a shower! 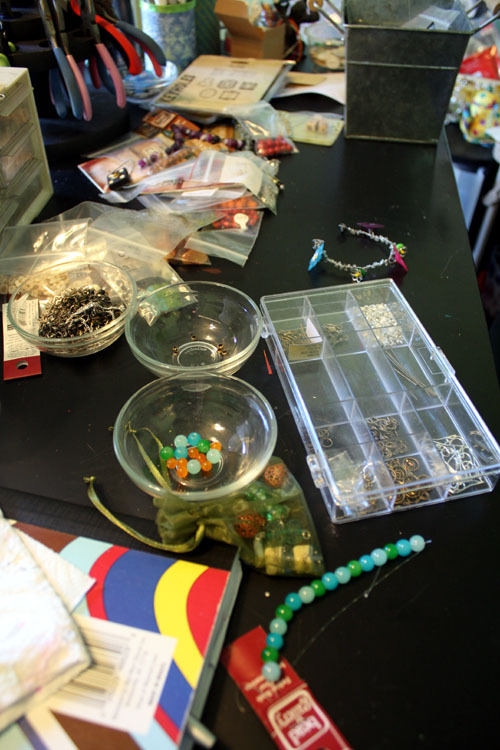 First and foremost, it's Bead Table Wednesday. 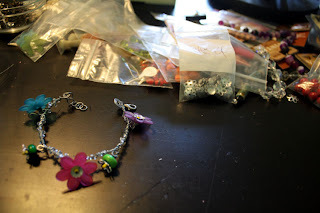 Since I'm most likely not going to be crafting today, I went ahead and took some shots of what the craft desk looks like this morning after making a few bracelets yesterday. Check out the BTW Flickr Group for more beady tables! 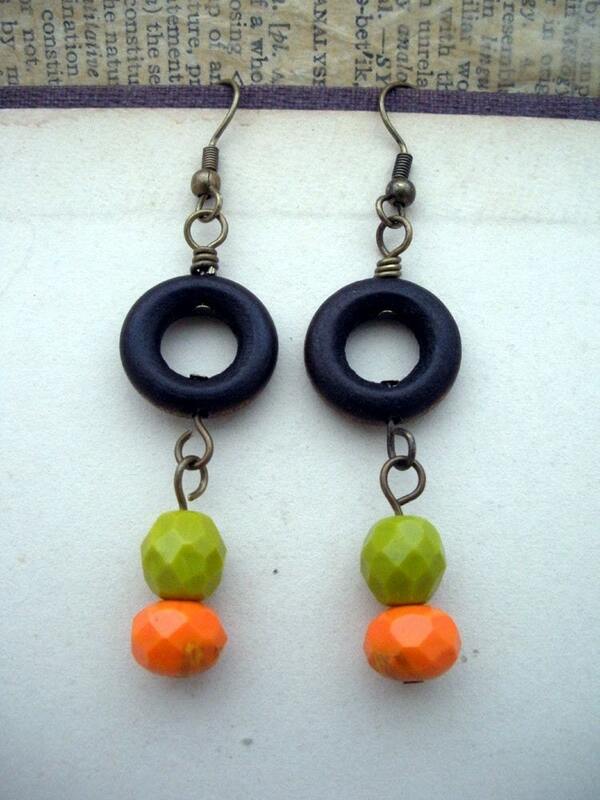 There are some new earrings in the shop. There's something so very 70's about these. . .I'm hoping that doesn't turn too many people off! I stumbled on another giveaway this morning that I thought I'd share. The fine peeps at Beaducation are giving away a set of metal stamps. Head over there for the details! Some of my favorite words together - beer cheese spread recipe. Like I said, I hope this post wasn't too rushed. ...and don't forget to sigh up for Ladies Stamp wrestling! Hahahahaha Happy wednesday Hope!!! Looks like a happenin' table, all right! 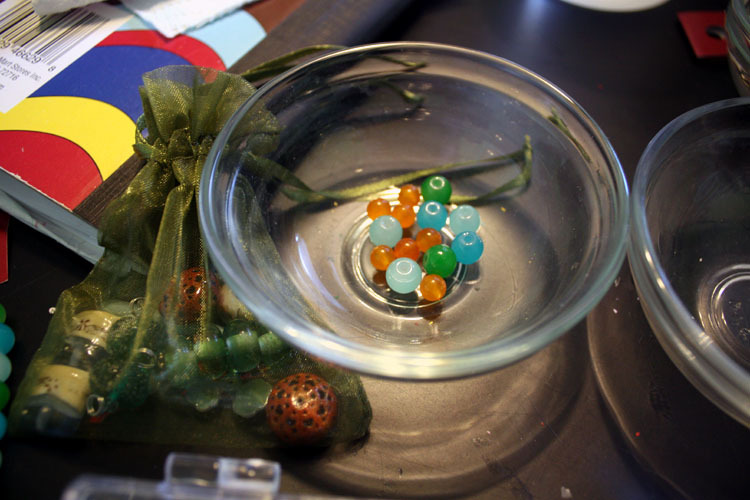 I'm loving that little... it appears to be lucite... bracelet. Can't wait for the flowers to start blooming! Patty, you crack me up!! Jam- the flowers are indeed Lucite. One of the bead stores near me has a bowl full of them. I think I need (want) more. The flowers here have already started. Sorry. Holly- I loved that as well. Would totally wear it also. Must make one for next year!